Milady’s Dress for sale features dark blue and royal blue fabric with silver and gold designs. This medieval gown has a beautiful lace up back and is made in two pieces. The bodice and lower portion of the sleeves are manufactured of rich dark blue brocade and embroidered with silver and gold designs. The upper portion of the puffy sleeves and the full lower skirt of the Milady’s Dress are crafted of a shimmering royal blue material. A royal pin adorns the upper bodice. The neckline has a darker silver trim, while matching silver strands are sewn to the upper part of the sleeves. This dress is made of a poly-cotton blend and polyester. Buy the beautiful Milady’s Dress for only $169.99. 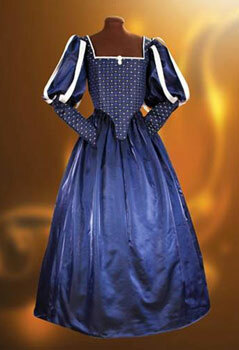 Farthingale for sale is an ideal addition to any Renaissance or medieval dress. The Farthingale was the precursor to the petticoat. This hooped undergarment accentuates the overall shape of any medieval dress or Renaissance gown. 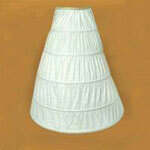 This farthingale is manufactured of a white, lightweight polyester cotton blend. It contains 5 metal rings. The farthingale requires some assembly. Five adjustable inner bands create the bone of the garment. The farthingale also has plastic, quick release buckles which permit the rings to be removed for washing. To add authenticity to any Renaissance gown, medieval dress or Halloween costume, buy the Farthingale for only $89.99.